For some time now, I’ve been waiting patiently for Danny to hunt enough squirrels to make one of my favorite dishes…Paella!! Like Italian risotto, paella is the signature dish of Spain. It’s the communal, rustic, quintessential Sunday meal of Spaniards, from Cantabria all the way South to Andalucia. Just like risotto, this one pan dish has it’s learning curve. When to add the liquid, when to remove it from the heat, how to gain that amazing sticky bottom called the “socarret.” This rice dish is all about the layers of textures created in the pan. It’s crispy on top, creamy through the middle, and sticky at the bottom. The type of rice is the most important ingredient. 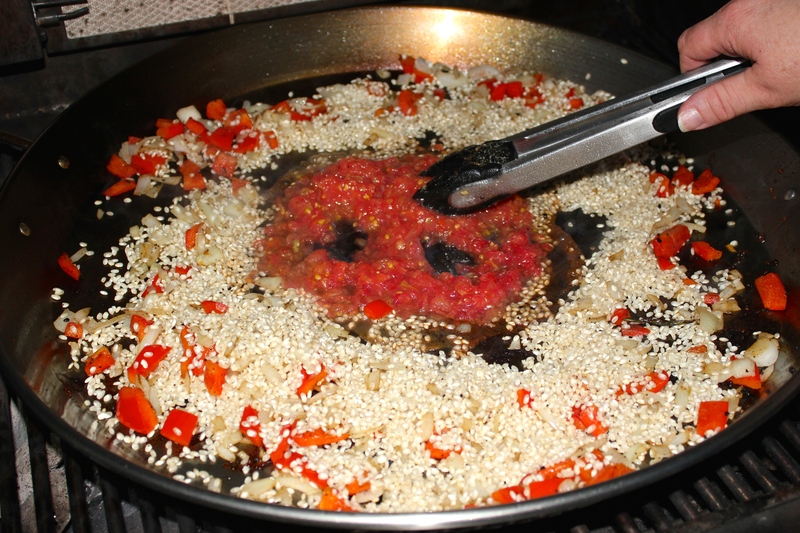 You want to use the calasparra “bomba” rice which creates the right consistency in the paella. The patience to make the sofrito, a kind of flavoring condiment. You also need a pan made from the right metal. 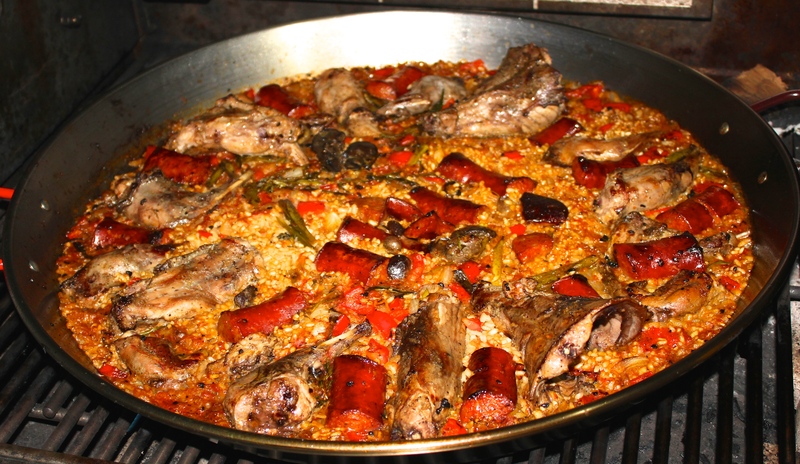 The name of the dish “paella” comes not from the name of the dish, but the name of the special pan from which it is cooked. There are several types of paella pans, but the one I’ve found works best is a polished carbon steel pan, with small dents in the bottom to keep the flat shape throughout the pan, this promotes more even heat distribution. This pan needs care so it doesn’t rust, but develops a beautiful well worn patina, announcing that it has been seasoned and used often. Then there are the spices used in this traditional dish. Flavors of saffron, and pimento (Spanish paprika), and nora peppers, are used often. 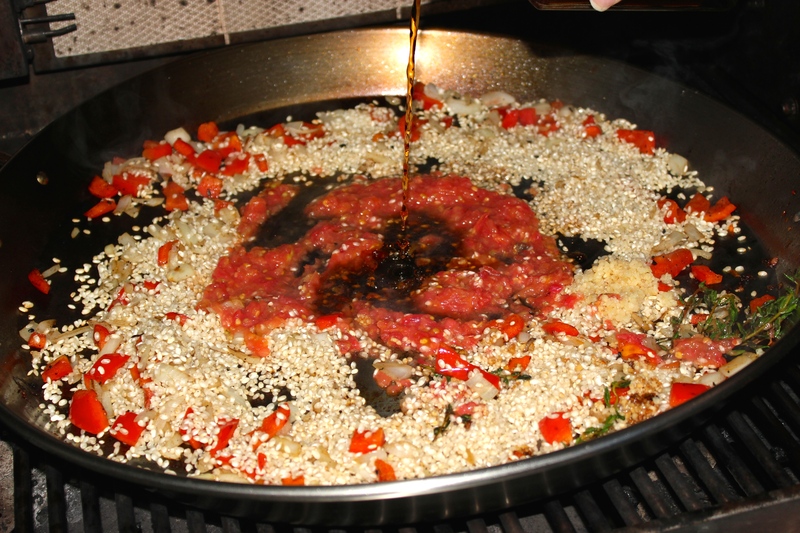 Beyond those considerations, you have creative license to create your own special paella!! Once the paella is prepared, the next consideration is “how paella is served”. Since this dish is communal, that means even eating it from the same pan has its rules. First, the utensil is mainly a wooden spoon. Some folks believe using metal utensils impart a metal taste they don’t like. I don’t find it a problem, but if staying within the tradition is important, do as they do. Also, since everyone eats from the same dish, a little propriety goes a long way. Each guest stays within his/her own boundaries within the pan. I like to think of the pan as a large pie pan, where everyone gets their own “slice” in a pie shape configuration. This is also why the position in which the meat is laid is important. Its spread out evenly, not just for presentations’ sake, but so each guest gets an equal share of the meat/seafood. Of course, it’s perfectly okay to push a particular meat/seafood to the center of the dish, if it’s not your favorite. Someone will take that as an invitation to eat your unwanted portion. So with those simple considerations in mind, let’s get our “paella on”!! First, prepare your pan. I use carbon steel paella pans, so it’s important to keep the pans dry after cleaning, as they will rust. After each meal, I wash the pan with hot soapy water, then dry well. I use a very thin coating of grape seed oil applied with a paper towel, as a protective coating. If it’s been a long time between uses, wipe the oil layer from the pan, as it can become rancid. Next is assembling all your ingredients. For this paella, I used three squirrel, and a package of Spanish chorizo (not Mexican chorizo, which is vastly different). 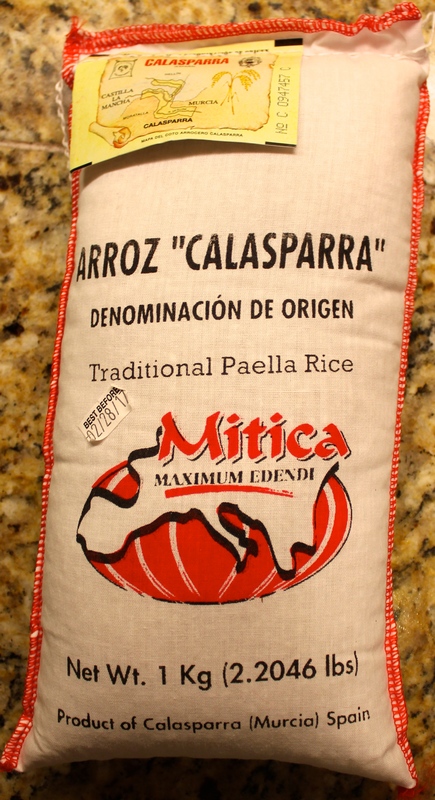 Since I don’t have access to a Spanish grocery store in my town, I pre-ordered the “bomba” rice from the Calasparra Region of Spain, through amazon.com. The only suitable substitute for the bomba rice is an Italian carnaroli rice. Their cell structure is similar and will release the right type of starch in the liquid. Once I have those elements ready, I begin work on the grated tomatoes. If you want to save time, a can of crushed tomatoes, drained of extra juice is okay (remove any skins), but the flavor results are better by prepping fresh tomatoes. I used heirloom tomatoes. I rinsed the tomatoes and sliced them in half and scooped out the core and some seeds and discarded them. I used a box grater to grate the tomatoes, and discard the leftover skin. 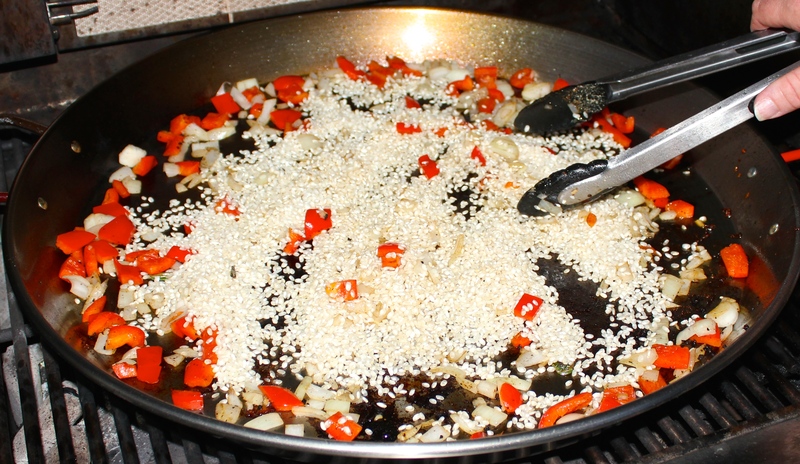 Some paellas are made with a “sofrito”, which is a sort of flavoring condiment or base. There are some vegetables like onions, and garlic and tomatoes which are cooked down to make the “sofrito”, but I’m not doing that technique for this particular dish. Then I heat my stock to very hot, but not boiling. I dice all my vegetables, and have my spices ready, and the rice is measured out. 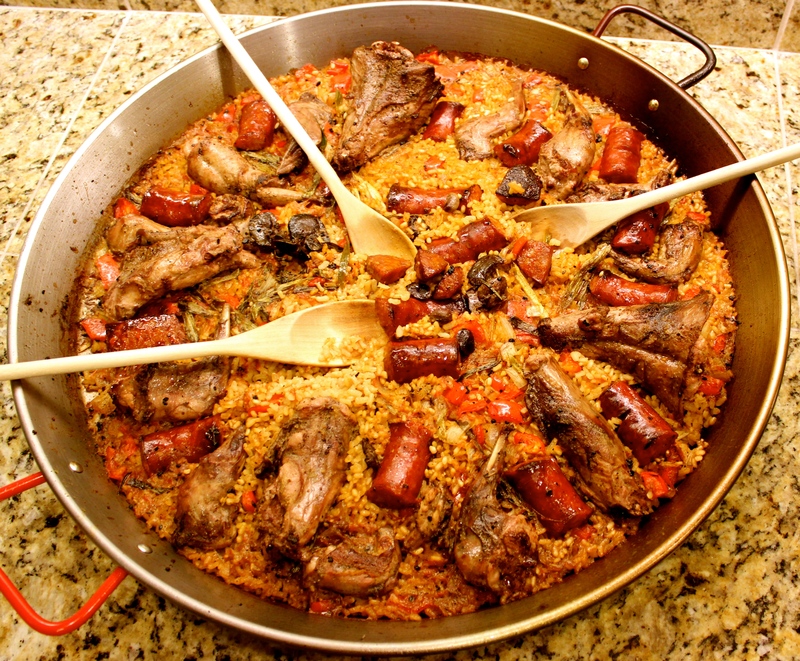 Paella is traditionally made over open camp fires with hard woods and sometimes fruit branches, but it can also be made starting on the stovetop then finished in the oven, or on the grill. I used my grill, so my directions will be for grill cooking. My grill barely fit my newly purchased giant paella! 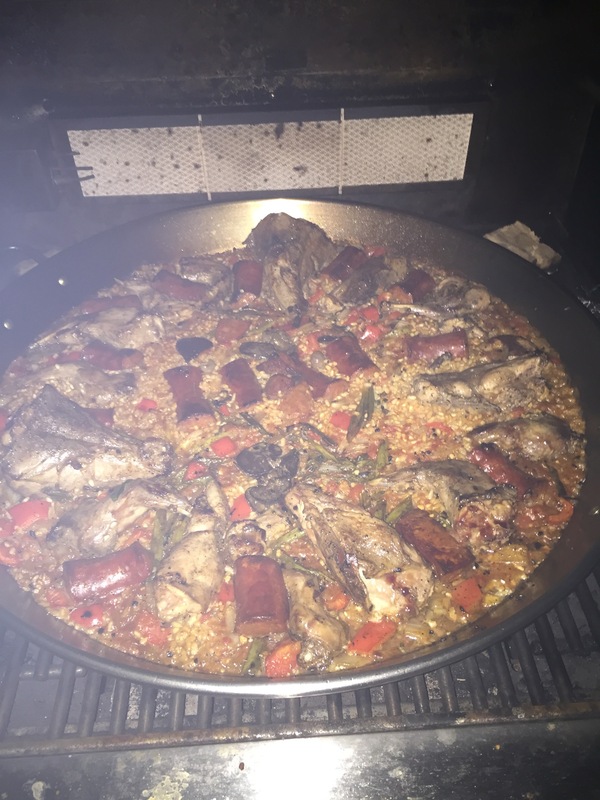 To mimic the smoke created by an open fire, I added a few stems of rosemary, and large hardwood chips directly on the grill, so a nice smoke develops and it works wonders to impart those flavors into the paella. For this paella, I first fried the three inch cut pieces of chorizo in the paella pan. 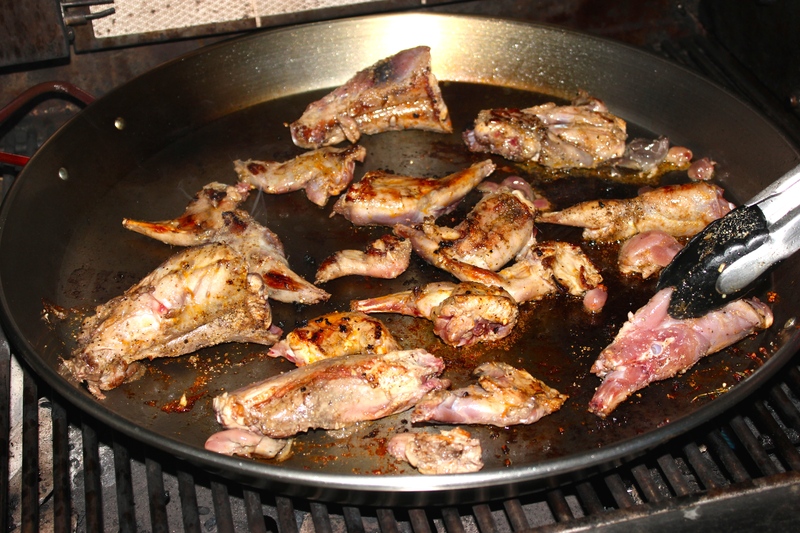 Then I browned each side of the squirrel pieces in the rendered chorizo fat. Then a quick sauté on the sliced spring onions and added some minced garlic and a few sprigs fresh thyme and a stem of rosemary on the rim. I removed them to a bowl after sautéing. Next came the diced onion and red bell pepper. I added a bit of grape seed oil and added the rice. I moved the rice around to coat the grains with the oil. Keep moving the rice and adjusting the flame so as not to burn the rice. Then I pushed the rice from the middle and added the skinned, and grated tomatoes. Once the tomato juice was evaporated a bit, I poured sherry wine vinegar over it. I sprinkled the Spanish paprika over the rice. I added the sautéed spring onions back in and poured in the hot chicken stock and gave the rice a stir and shook the pan to evenly distribute the rice. I turned the burners down half way so the liquid doesn’t boil out too quickly… this is where you need to learn how to adjust the heat by watching the dish… you’ll become accustomed to your grill and how to properly adjust it. Then I added the chorizo and squirrel back to the pan in a pattern on the outside rim of the pan and extra in the center. I placed a few stems of rosemary and large chunks of hickory wood directly on the grates. The grill cover is closed and I set a timer for 17 minutes… Do not disturb the rice by stirring. After 17 minutes, I checked the rice to see if it needed any extra liquid poured over. I added just a little and adjusted the flame, and turned the pan to even out a hot spot. I set the timer for another 5 minutes. After 5 minutes, I left the grill cover open and turned up all the burners to burn off the extra liquid and help to create the “socarret” in the bottom of the pan. The starch from the rice is what sticks to the bottom. You turn up the burner, and watch carefully for steam to come out of the center of the paella… as soon as the steaming stops, the smell of the paella will begin to change, watch for this so the paella doesn’t burn, at that moment,the paella is ready, so immediately turn off the burners. Allow it to rest for a couple minutes, then serve and enjoy!!! 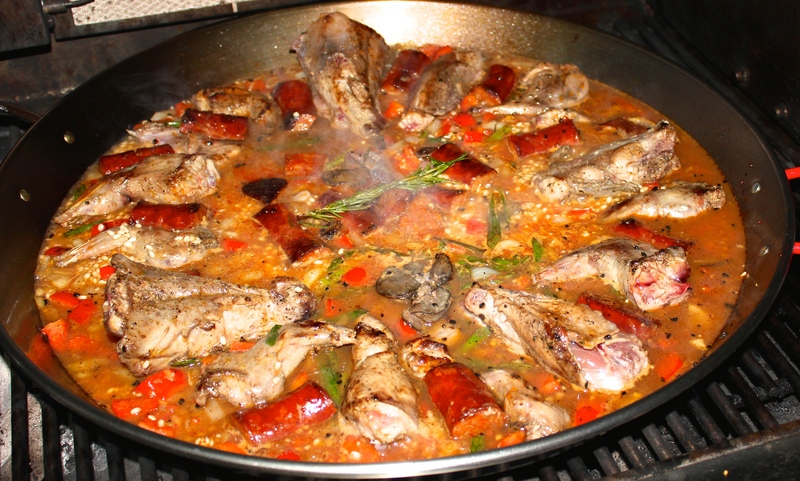 Let's go on a trip to Spain, wild game style with He Hunts She Cooks yummy Squirrel Spanish Chorizo Paella!! 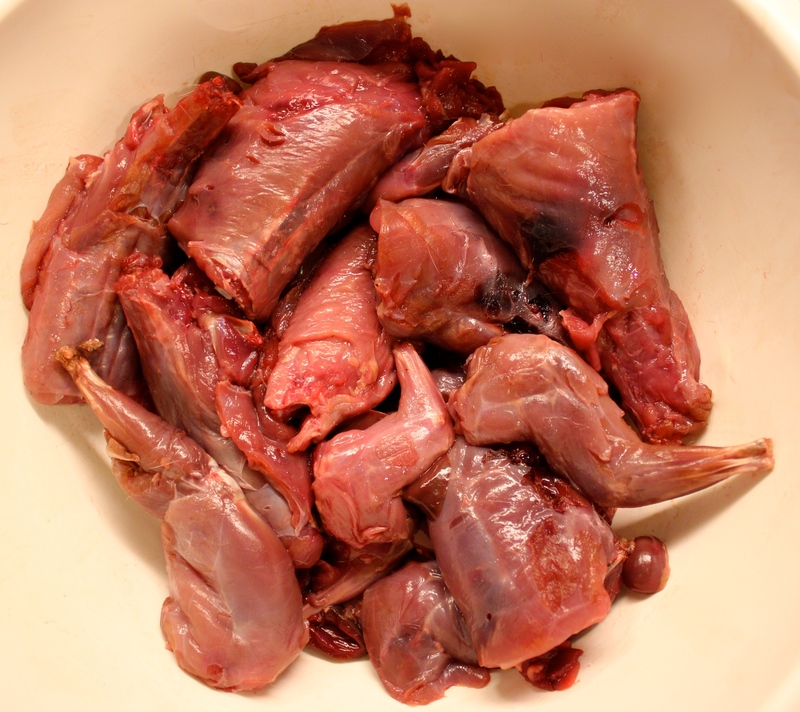 Butcher squirrel into shoulders, hind quarters, and split the saddle in half, add the heart and liver and all pieces to a bowl, and season with kosher salt and pepper, set aside. Dice onions and red bell peppers and set aside. Slice the scallions on the diagonal and place in a bowl, and set aside. Rinse the tomatoes and slice in half, and remove the core and some seeds. Using a box grater, grate the tomatoes, and discard the skins. Add the grated tomatoes to a bowl and set aside. Heat the chicken stock in a pot, and keep hot until ready to use. Measure out the rice and set aside. Have the two paprikas ready. Heat the grill to 400ºF. 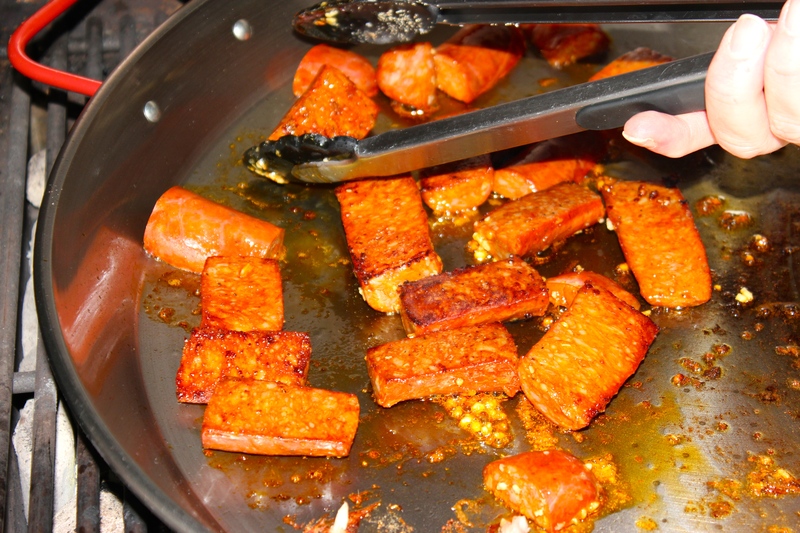 Place the paella pan on the grill and add the chorizo, and brown the chorizo on both sides. Remove the chorizo, or push to the outer edge of the pan, and add the squirrel. Brown the squirrel on both sides, and remove the meat to a bowl. 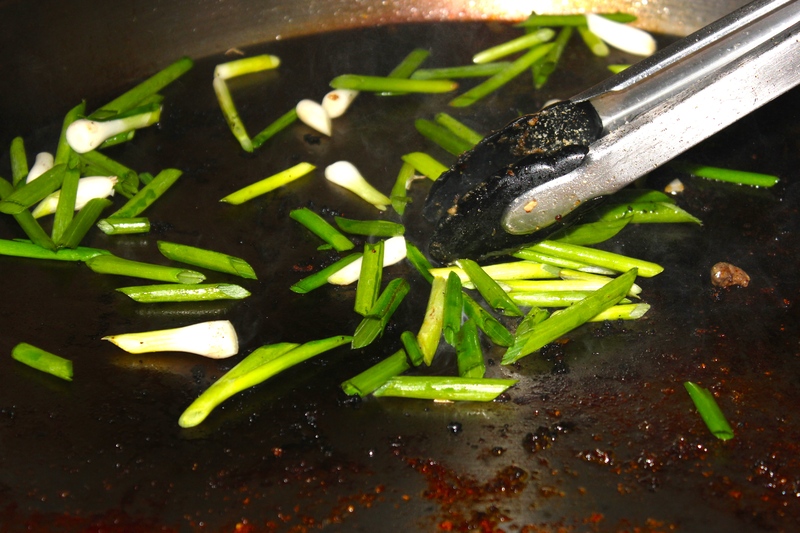 Add the scallions and thyme sprigs, minced garlic and one stem of rosemary to the pan, and sauté for one minute. 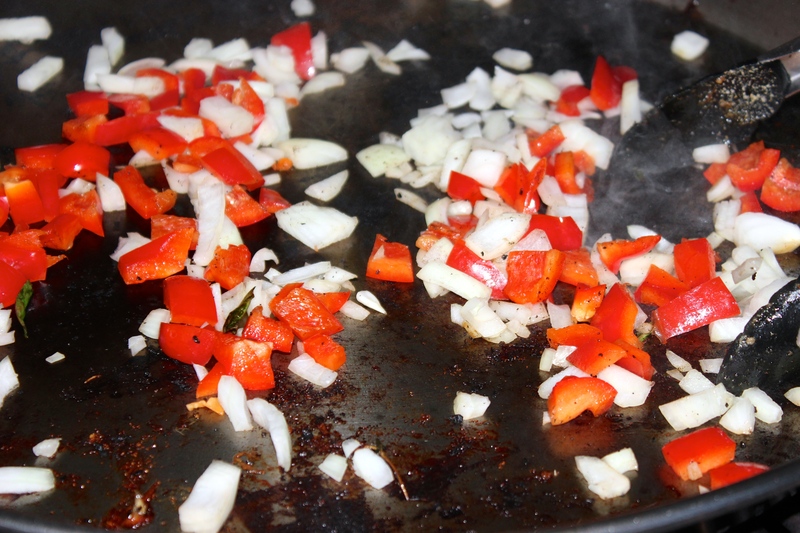 Remove all and add the onions and bell pepper, sauté for two minutes, adding a little oil if needed. 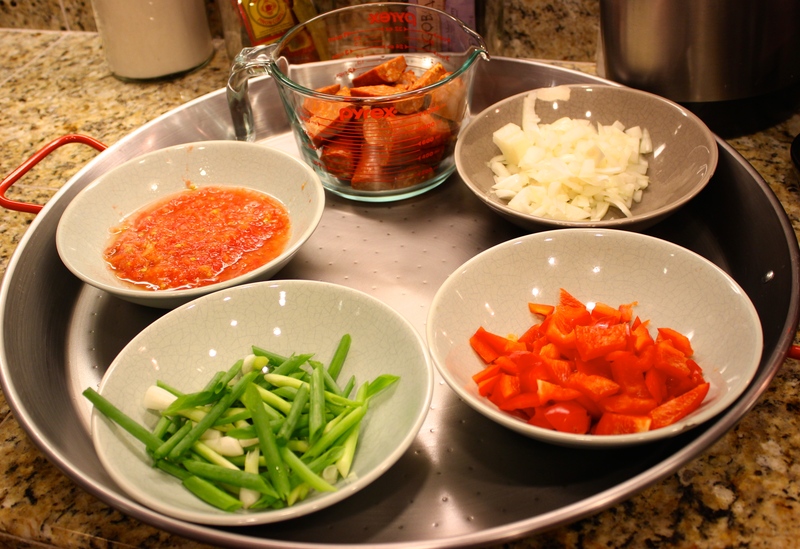 Move the onions and peppers to the rim of the pan, and add the rice. Move the rice around to coat the rice, for about 2 minutes, being careful not to let the rice burn, adjust the flame if needed. Make a well in the center of the pan and add the grated tomatoes, and allow the juice to evaporate a bit, about 3 minutes. Pour the sherry wine vinegar over the tomatoes. Add the green onions back in. Pour in 5 cups hot chicken stock, and reserve the last half cup of stock if needed for later. Give the rice a stir and shake the pan to spread the rice out evenly. Add the squirrel and chorizo back to the pan and go around the rim of the pan and place the meat evenly around the pan and place chorizo in between, and add any extra to the center. Place the remaining 3 rosemary stems, and large wood chunks directly on the grill, and adjust the burner to half way. Close the lid and set a timer for seventeen minutes, **DO NOT STIR as the rice should stay undisturbed. 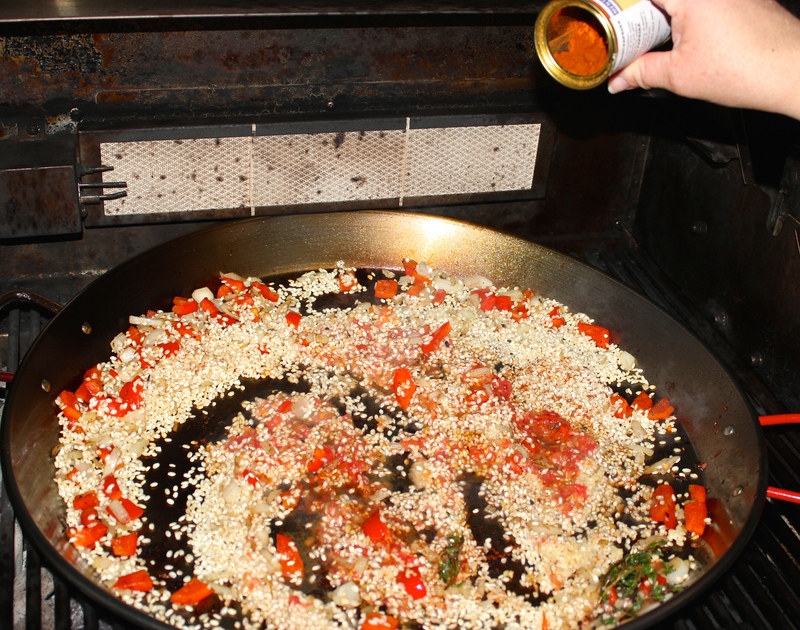 After seventeen minutes, check the paella to see if it's cooking too quickly and if so, turn down the heat. If it's your first time making paella, take a small bite of rice to see if it's cooked enough, but try not to disturb the rice. Carefully add any remaining stock if needed. Close the lid for 5 more minutes, but if no more liquid is needed, continue to the next step. Open the lid and turn up the heat to high, and allow the steam to develop, and leave steam for up to five minutes, while the paella releases all the extra liquid and develops the "socarret". Once the steam has stopped, wait until the smell of the dish begins to change, before it burns, then quickly remove the pan, and let stand a couple minutes.